Yaniv Masjedi is chief marketing officer at Nextiva, an industry-leading cloud communications provider, headquartered in Scottsdale, Ariz. He manages the firm’s marketing and branding efforts and initiates programs related to brand management, demand generation, advertising, marketing communications and thought leadership. In addition to his work at Nextiva, he also writes on various business topics for publications such as Entrepreneur.com and HuffPost. I grew up in Los Angeles and am one of four kids. I always thought I wanted to be a lawyer, so I went to UCLA for political science and history, thinking I’d go straight to law school afterwards. That all changed, through, when I took a job during college at IPOWER, a web hosting company in Santa Monica. It was really exciting because the company was growing rapidly, and I loved being part of a team on the cutting edge of technology. At first I worked in sales and my shift was from 6 a.m. — 2:30 p.m. Immediately after work, I’d head to school. As challenging as that sounds, I didn’t mind it at all because it was such an exciting time to work in that industry. A few months after I started, a marketing role opened up at IPOWER and I jumped at the opportunity. Even though I’d never taken a marketing class, the leadership team gave me a shot. I immediately fell in love with marketing. Tomas Gorny and Tracy Conrad, the two leaders of the company, are incredible marketers, so I learned a lot from them. IPOWER merged with Endurance International Group, and in 2006 Tomas came up with the idea for Nextiva. 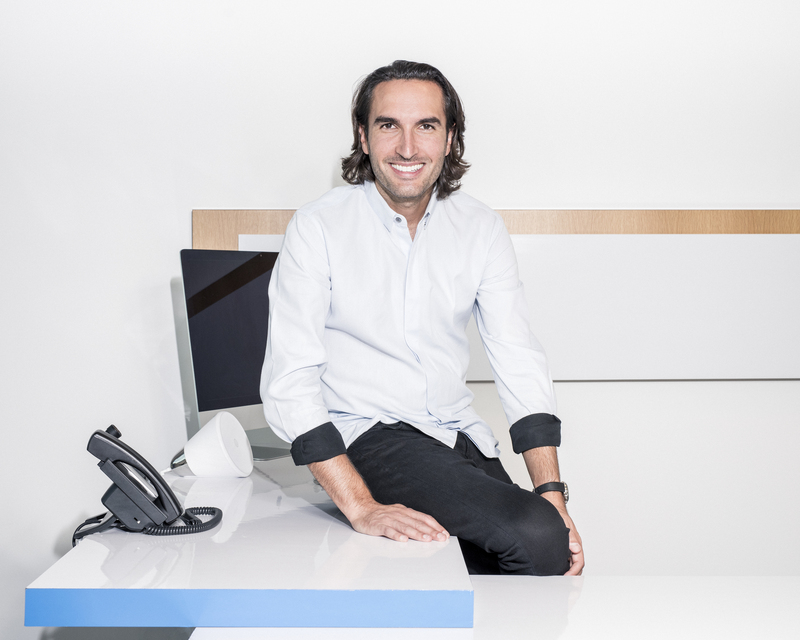 He wanted to transform business communication, starting with phone service. He was tired of the lack of innovation and poor care for customers and employees. Nextiva was the answer for an entire industry. Amazing Service is still the cornerstone of our brand promise to this day. Inspired by this, I followed him and Tracy to Nextiva and was part of the founding team; we welcomed our first customer in 2008. From the beginning, Nextiva’s leadership team has always been focused on growing the business for the long term, not having an exit strategy and doing right by our employees and customers. It’s been an incredible ride. Today we’ve expanded beyond business VoIP, employ 1,000 team members all over the world, serve more than 150,000 customers, and are growing more every day. In terms of funny moments, few top the time at Nextiva, maybe back in 2010, when the management team decided to play an April Fool’s prank on a number of people on our team. For those inside our offices, we temporarily had our domain name forwarded to our biggest competitor. People freaked out. When they realized it was a joke, and that no one outside our office was redirected, they relaxed and laughed about it — but it was a frenzied few hours. Growing as quickly as we have — from five people in a tiny office in 2008 to 1,000 people across multiple offices worldwide — has proved quite challenging (and fun). It was so easy back in the early days to be on the same page, to make quick decisions and to move with incredible speed. In a lot of ways, the speed at which we move hasn’t changed because our management team is really aligned, but scaling and hiring that many people has involved some bumps in the road. How have we overcome it? We’ve spent a tremendous amount of time focusing on hiring the right people, and maintaining consistent communication throughout the company. From day one, for example, we’ve focused on providing genuine and authentic customer service and that hasn’t changed. Leadership means leading by example and recognizing that we are all part of a team. Success isn’t defined by the actions of a single person, it is defined by each person in a group delivering on what they set out to do. And above all, true leadership is treating people with respect at all times, even when things are going sideways. If I had to choose one person it would be Tomas Gorny, Nextiva’s co-founder and CEO. I’ve been working with him daily for more than 15 years now and am honestly astounded by him every day. He is a visionary. While he started Nextiva as a company focused on VoIP, he knew from the first day that he wanted to expand that vision beyond phone service. He has a real knack for knowing what will be important in the future. He’s also an incredible people leader. Our award-winning company culture is largely thanks to his leadership. It’s a little difficult for me to think of a particular story because watching Tomas every day provides a constant reminder that there is always an opportunity to be better. He has emphasized this from the beginning and it has never shifted. He always reminds us of opportunities to capitalize on and that it is important to keep pushing to be better. This is a really special thing because it can be easy to sit back and relax when things are going well. It hasn’t been difficult for me to manage my personal life and my work life because I see them as feeding each other. I’m really lucky to love what I do, so I never feel burned out. I enjoy being at Nextiva, even working odd hours at times. I don’t see it as work; I get excited to come into the office. On the flip side, I do also value time with my family and friends and make time for them, too. I’m lucky that I can do both pretty seamlessly. No, I haven’t found that. Yes, in the past 10 years my responsibilities have grown at Nextiva, but I’ve enjoyed those shifts. I like watching the business grow and helping our customers. Even with those responsibilities, I make time for non-work activities. I’m an avid tennis player and have a great coach I practice with regularly. I’m also really active in the lives of my nieces and nephews. Travel is also important to me. Part of my ability to integrate these two sides of my life is thanks to the nature of Nextiva. We provide services that allow people to work from anywhere, which helps me when I’m not in the office. One thing that has changed for me in the past few years is that I’ve become more mindful of cutting out any nonsense in my life. I’ve increasingly tried to surround myself with people I enjoy being around, which has been a big life upgrade. I also got off most social media — with the exception of LinkedIn — a few years back. That small change opened up a ton of time for me to spend on Nextiva and with family and friends. Full disclosure: I’m not a huge fan of the concept of work/life balance. Those two things are very intertwined for me, and I’m happy with that. I read an awesome Naval Ravikant (CEO/founder of AngelList) quote the other day, “If you can’t see yourself working with someone for life, don’t work with them for a day.” I live my life by this. Work is such a huge part of our lives that I focus a lot of energy on the people I surround myself with. I find that this helps my entire life — both work and personal. Purge the energy suckers. You are who you surround yourself with — at work and at home. Life is so much better when those people are amazing humans. Cut out unnecessary activities. For me, this was social media. For others, it might be video games. The more time you have, the better and more authentic connections you will enjoy — at work and at home. Rethink the ‘shoulds.’ This is a biggie. A lot of us feel awful about the amount of hours we work at an office and the amount of hours we spend on our non-work hobbies. Take a moment to question if those ‘shoulds’ are helping you live your best life. What if, like me, you love to go to work? There is no shame in embracing your true nature. Listen to your team. If work/life balance is an issue for your employees, sit down with them and ask what would make them happy. Don’t assume you know the answer. Every employee is motivated by different things. The best thing you can do as a leader is to listen and then to try to make their lives better. Try not to compare yourself to others. This can be tough, but I highly recommend the practice. Maybe your best friend works eight-hour days, takes six weeks of vacation and showcases happy pics on Instagram. Instead of comparing yourself, try to redirect that energy to figuring out what will make you happier in your life and do that. Watching Nextiva continue to grow gives me a tremendous amount of pride. I love seeing how businesses find value in what they do, and how we make the lives of individuals easier and more enjoyable. Internally, I really enjoy watching our team members’ careers develop. Thanks to working at Nextiva, I’ve seen employees meet, get married and have children together. I’ve seen people learn new skills and travel to new places around the globe they never thought they could, all because of their career trajectories. Enhancing other people’s lives, helping our customers, and then watching our customers help their customers — it’s an ecosystem and a community that I love being part of. I’d love to start a widespread movement around corporate giving programs, or CSR (corporate social responsibility). Yes, many large companies have programs like this, but I think companies of all sizes can do this. It doesn’t have to be complicated or cost a lot of money to give back to your community. We have a program called Nextiva Cares, where we regularly partner with community organizations and give back. Business isn’t just about sales and revenue. It’s important to remember that business can be a force for good, too. You can follow/ping me on LinkedIn, and also follow everything Nextiva is doing on Facebook, LinkedIn and Twitter.